Scrumptious, down home comfort in a bowl. That’s all we need to nourish and restore our senses at the end of the day, that and a cozy bed to sleep in, but eating comes first – always. 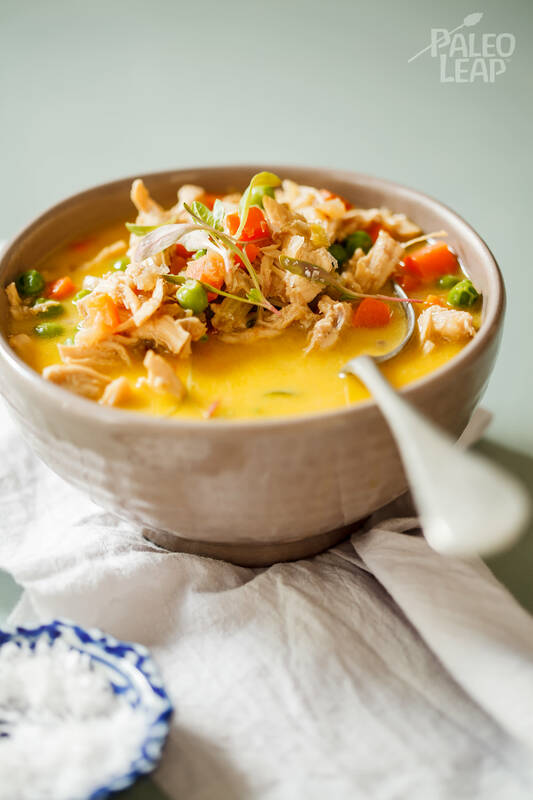 You’ll want to be prepared though to stir up this creamy chicken pot pie soup at a moment’s notice. In order to accomplish the great feat of dinner in half an hour or so, you’ll want to have some cooked shredded chicken already on hand. Make a larger batch in your slow cooker, freeze individual portions for later and always be prepared for when hunger strikes. If your shredded chicken is not pre-spiced, may we suggest adding some fresh herbs to up the flavor and complexity of the soup? Our favorites include a pinch of chopped sage, rosemary and thyme, though we encourage you to develop your herbal palate and toss in whatever you think melds well with the other ingredients. Whatever you do, do not skip the garlic. Garlic is a must, and the more the better. This chicken pot pie soup is absolutely amazing, if we do say so ourselves. However, if you are missing out on that delicious crust that would accompany a traditional chicken pot pie, yet still want to keep your ingredients on the gluten-free side, go and seek out a scrumptious recipe of Paleo naan – most recipes use three ingredients, and your taste buds will never be bored again! In a medium pot, melt the coconut oil then sauté the onion, carrot and celery for 5-10 minutes, until soft and fragrant. Add the garlic and bay leaves, saute for another minute before adding the chicken stock and coconut cream. Allow to simmer for 10 minutes, then add the shredded chicken and frozen peas. Cook for a further 10 minutes until the chicken is heated through and the peas are cooked.